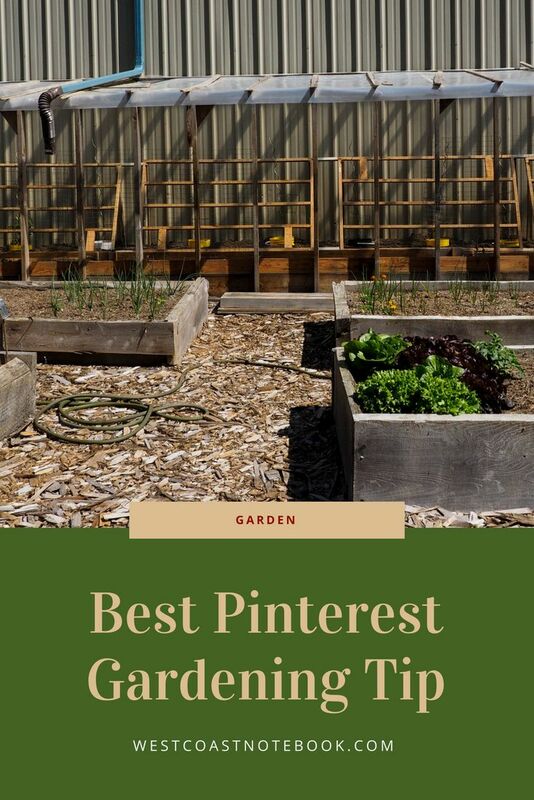 All of us have favourite tips that we’ve found depending on our needs and what I’m going to share with you is the best Pinterest gardening tip that I have found. Now there are lots of gardening tips on Pinterest and it’s a wonderful site for getting ideas. If you go to Pinterest and type in gardening tips you will find hundreds of ideas. As you can see, you can find a tip on just about any subject to do with your garden. Now, I definitely haven’t been through them all but I frequently visit the topic when I’m looking to see if there is a cool tip to grow sweet potatoes or delphiniums (my latest searches). Over the years I’ve saved a lot of tips so I could go back later and revisit them but for some reason, I never saved this one. But… I did remember it as I thought it was such a good idea. I have been asking Rob if he could make it for me for the last couple of years and finally this year it was one of my birthday presents. Love these types of presents. Can you guess what it is from the picture below? It’s yellow, white, black, blue and round and makes my life so much easier. The reason these are so brilliant is that it allows you to water the plant and not the whole greenhouse. It also allows one to fertilize the plant and/or add additional nutrients directly to the roots of the plant. …and it works a treat. Normally, we dig a large hole and plant making sure that the plant is in a bit of a hole so we could water it like filling a puddle. But, what would happen is that the soil dam around the plant would break down with watering and eventually they were just getting surface water rather than getting to the roots. We had the buckets (5 gallons) but as they were intact they were virtually useless. Rob finally used a table saw to cut the bucket into 3 pieces. First, the bottom was cut off then just eyeing it for height (no tape measure involved) make two more cuts to end up with three plastic circles. The top sections still have the handles on. Then after planting the tomatoes, I just pressed the circles into the soil around the plant and twisted it into the soil to form a seal. Hey, presto! Instant irrigation system. Now I just go along the row and fill the bucket pieces up depending on how tall the plants are. The taller they grow the more water they will get. This is going to be a great way to give the plant’s compost tea and fish fertilizer without having to spread it around the whole greenhouse. More cost effective as well. Of all the gardening tips I’ve tried from Pinterest, this one was the best. While I’m showing you the buckets I thought I would give you an update on the greenhouse as well. Here is what it looked like last year which was an improvement over the previous year. The dirt was just sort of piled up on either side and we put some bark mulch in the middle to keep the dust down. You can see the little craters that we planted the tomatoes in so they were easier to water. Tomatoes on the right and peppers, cucumbers, cantaloupe and a couple more tomatoes on the left. One of the main problems was that the hills of dirt on either side kept sliding into the middle and by the end of the year the pathway had disappeared. We had also made a fence of our tomato cages but it turned out to be pretty flimsy and was only about 3 ft high. So this year, we made a few improvements. 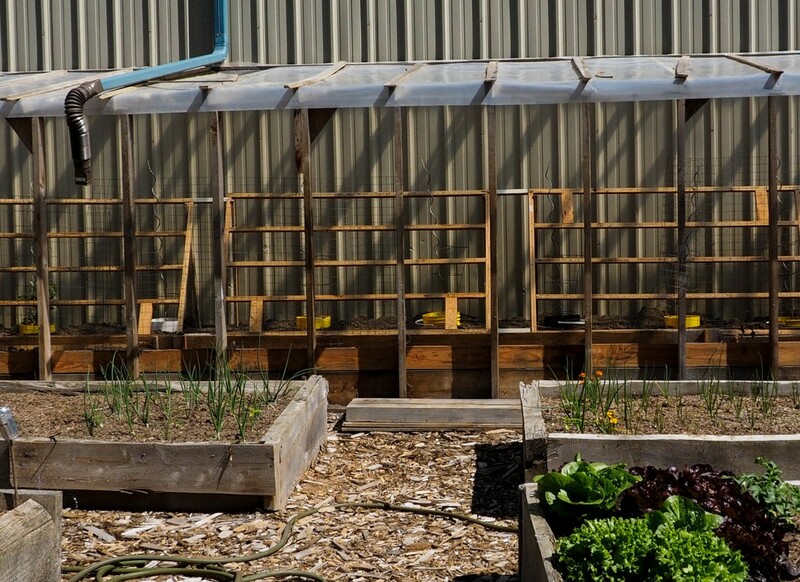 Created what is almost like raised garden beds on either side of the greenhouse with a proper pathway down the middle. 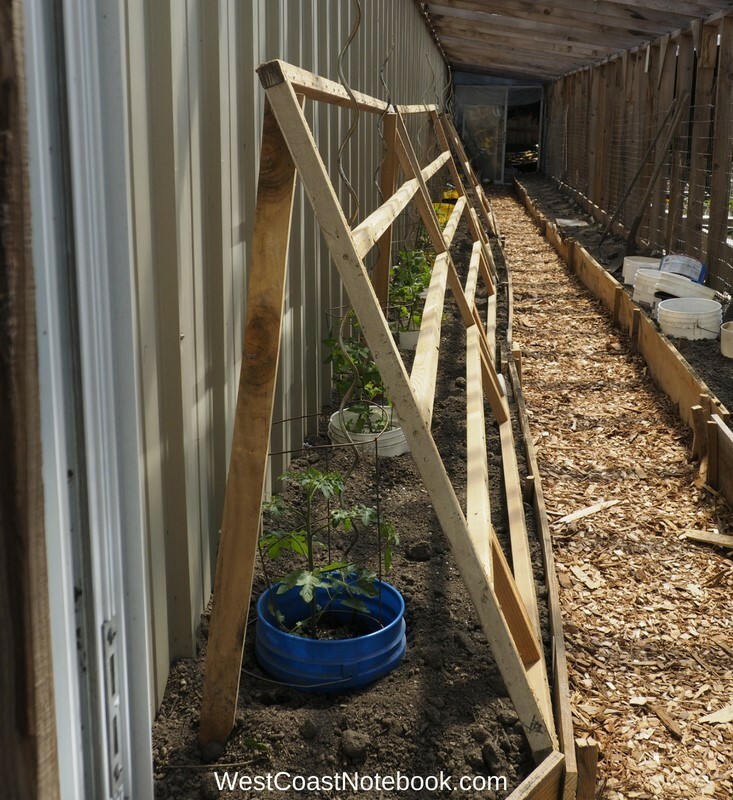 This was done by putting some planks along each side of the path and keeping them in place with stakes on the inside and outside of the planks. The stakes were pounded into the ground with a sledgehammer. 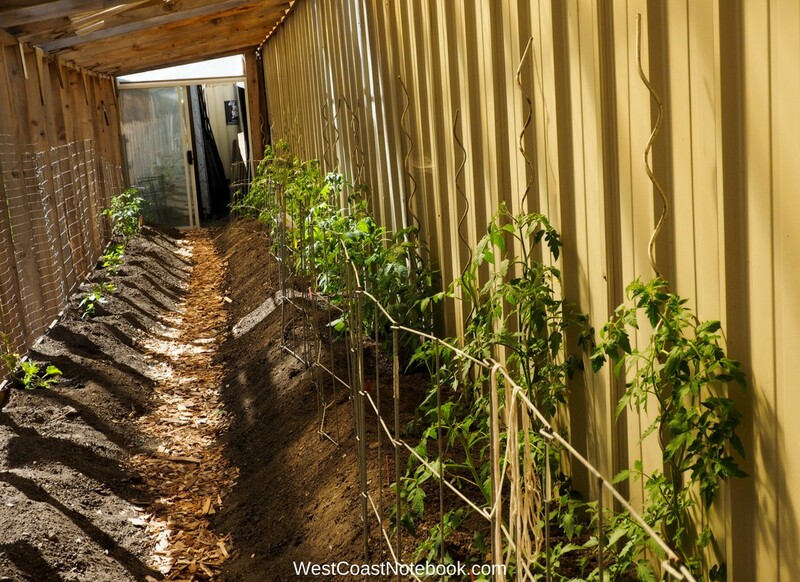 The right-hand side of the greenhouse is a corrugated metal wall of a building and the tomatoes get the benefit of the heat off of it. We went into a little overkill on the staking of the tomatoes, but hey… can you ever have too much? 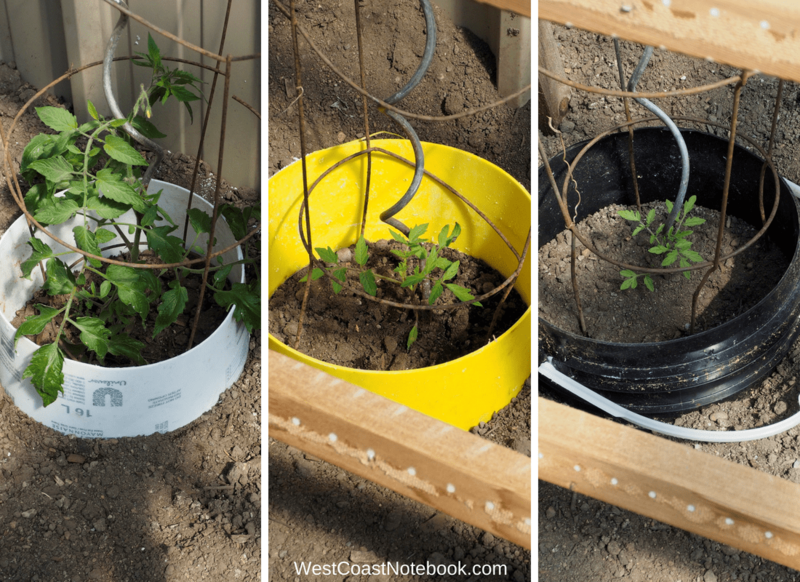 Using what we had, the well-used tomato cages fit right inside the buckets (very handy) and then we put in the metal spirals to train the tomatoes around. Now every time I water, I wind the top of the plant around the spiral as they grow so fast. These pictures were taken on May 23 and already the tomatoes have doubled in size. I started them from seeds and transplanted them when they were big enough. This year we decided to go a different route with trellising. We had these frames that were given to us and Rob took off the plywood to use for something else. Last year I used them out in the garden for the squash but as there was a bunch left over we decided to put them to use in the greenhouse. You can see from the picture below that Rob just put a couple of legs on each of them to keep them off the wall and we will train the tomatoes through the slats as they get taller. Lots of room to pick and grow, so we will see how this work or if we need to modify it next year. You are seeing it before the other side of the greenhouse was planted but as of writing, there are cucumbers down at the far end followed by peppers, some basil, cantaloupe and a few more tomato plants down at this end. There is wire down the open side for the vine plants to grow up on and it works quite well. As for planting in the greenhouse, we added in some new garden soil, compost and chicken manure. In the hole before the plants went in extra compost was added as well as a shot of Epsom salts. 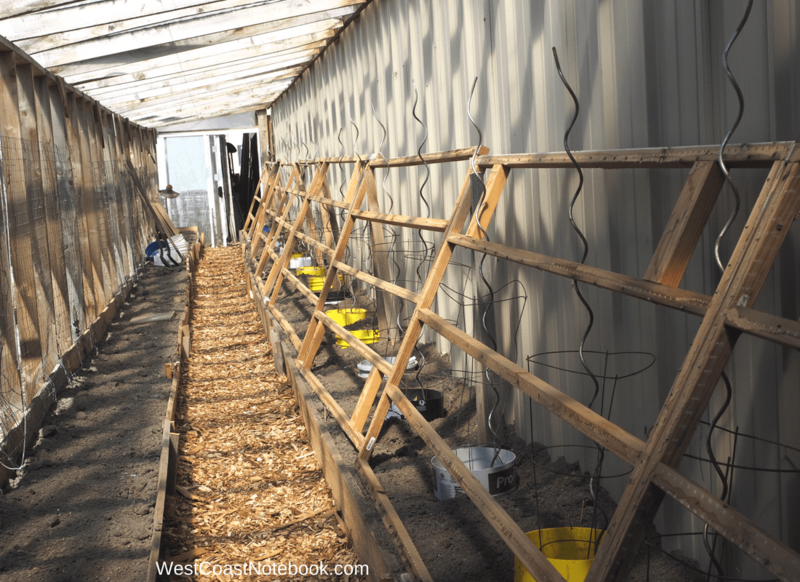 It’s always fun to find new way fo improving the gardening experience and for me, these changes have cut down on watering time and made the greenhouse so much easier to work in.